The roadside scenery in Kauai is so beautiful that it’s hard to not be distracted behind the steering wheel. 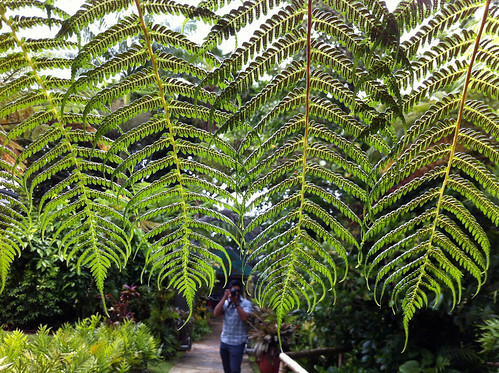 On our third day on the island, Nishan and I headed to the mountains in search of Kauai’s Hindu Monastery. Located near the Wailua River on the east side of the island, the monastery (also known as Kauai Aadheenam) is a traditional South Indian-style monastery-temple complex. 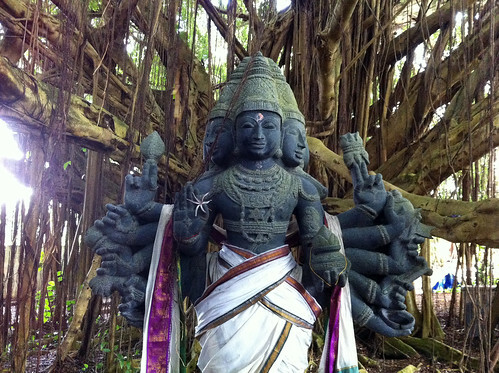 Founded in 1970, the 363 acre grounds house two traditional Saivite Hindu temples, the Kadavul Temple and the San Marga Iraivan Temple, an all-granite temple currently being carved in Bangalore, India, and assembled on Kauai. 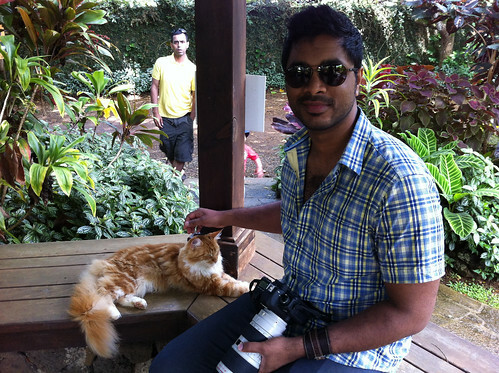 But really, all we wanted to do was hang out with our newfound furry friend, who we lovingly named Hindu Cat. After the puja, or ritual prayer, we explored the monastery grounds, a larger-than-life Shangri-La surrounded by lush greenery and waterfalls. This place was incredible, and I can easily see why a monastery would be erected here of all places. 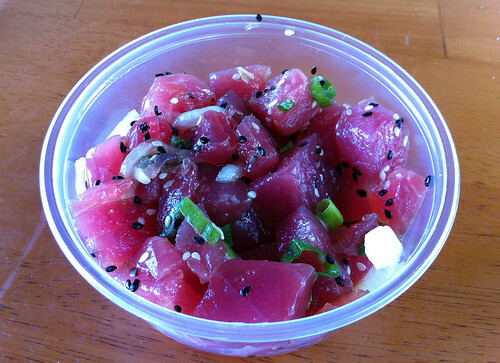 After the monastery, we continued our drive toward’s Kauai’s north shore, stopping at Kilaeua Fish Market for some poke and lunch. The poke was fresh and delicious. 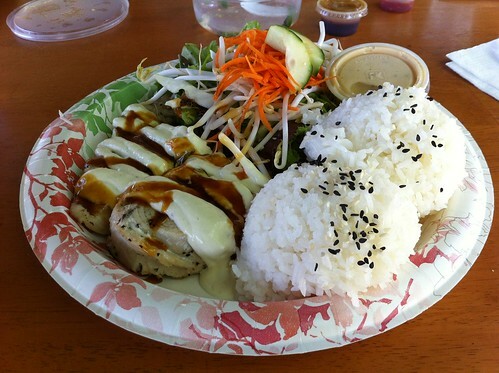 My plate of grilled ono fish? Not so much. Covered in too much sweet sauce and too much mayonnaise, I could hardly finish half my plate and focused instead on my salad and plain rice. Nishan felt sick from his ono tacos too. We called the meal a wash and got back on the road towards Tunnels Beach. 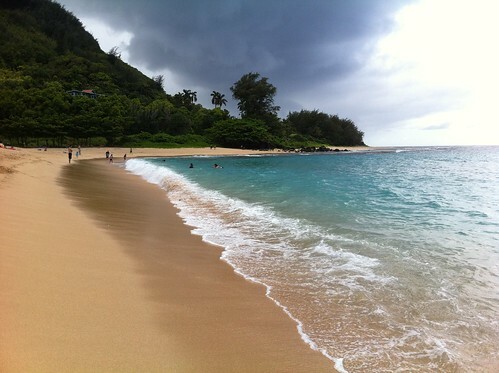 Tunnels, also known as Makua Beach, is surrounded by dramatic mountains and is an island favorite for snorkeling. Be forewarned: the roads to Tunnels Beach are a bit treacherous so be careful, especially if it’s rainy. Parking is also hard to come by so be patient. We arrived soon before a rainstorm hit, so we couldn’t spend too much time lazing about in the sun. After an hour of taking in the views, we got back in the car and drove back from where we came from, lest we face the roads in heavy rain. 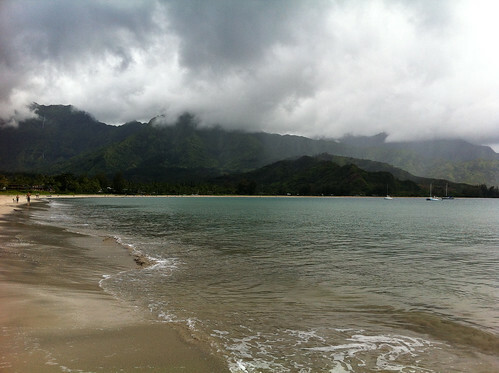 We couldn’t help but quickly stop at Hanalei Bay, though. The storm was approaching and the bay’s usually picturesque crystal blue waters had turned into a murky green. Oh well. Back in the car we went. 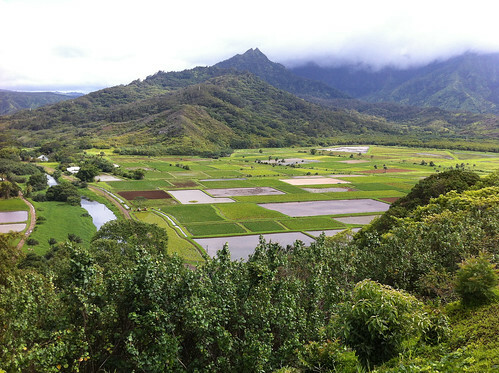 The best part of our drive back from the north shore turned out to be the Hanalei Valley Overlook, an incredible view of hundreds of acres of taro fields. 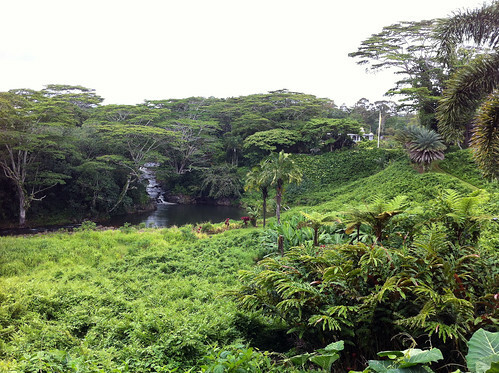 Grown for over 1,000 years, over 70% of all taro grown in Hawaii comes from here. Looking at all that taro made us hungry, so we stopped in Kapaa on our way back for a quick snack of spam musubi and thai iced tea with coconut milk at Mermaids Cafe. Back on the south shore, we had dinner at Josselin’s, a tapas-style Hawaiian restaurant in Koloa. We started with a deconstructed ahi roll, which was tasty but could have used more flavor. Some vinegar maybe? More salt? The salt and pepper octopus made up it in flavor. Super crispy pieces of of seafood paired perfectly with a spicy-sweet pineapple-flavored dipping sauce. 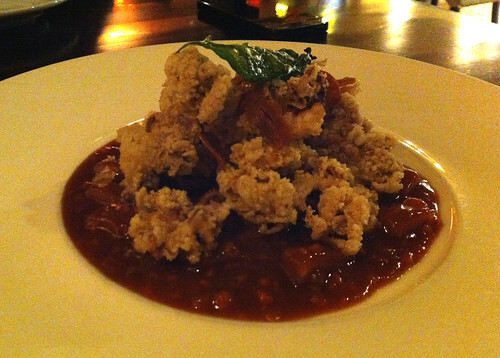 Next we shared a roasted heirloom eggplant salad. 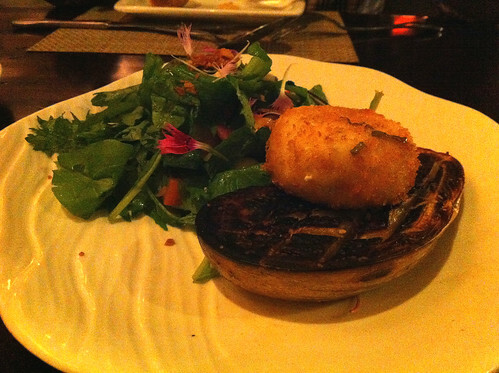 The eggplant was good, but the real star was the fried goat cheese fritter on top. 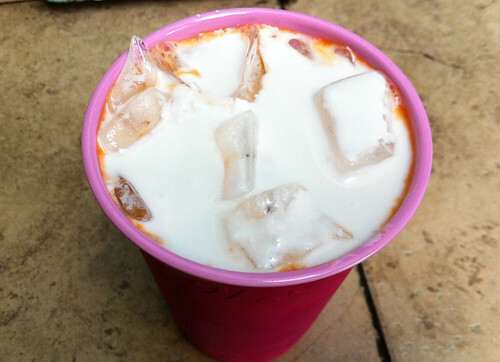 So gooey, so creamy, so delicious! We also shared plates of hoisin braised short ribs, slow-cooked butterfish, and malasadas for dessert. Malasadas are kind of like Portuguese donuts and they arrived in Hawaii in the nineteenth century when Portuguese laborers came to Hawaii to work on the plantations. I like the occasional donuts, but these were too sweet for my taste. 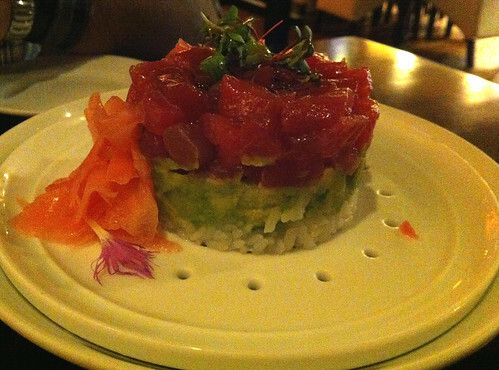 Still, Josselin’s was one of my favorite meals in Kauai, and the ambiance was perfect for a swanky night out. Happy and satisfied, we drove back to our condo for the evening to rest. We’d driven so much that day, and tomorrow would be no exception. Next up: the west side of Kauai.